Scalloped Oysters…How Could I Forget! How could I forget to list oysters on my menu? Drain oysters, reserving 1/2 cup liquid. Stir together oyster liquid, whipping cream, melted butter, and hot sauce. Mix cracker crumbs and next 6 ingredients in a separate bowl. Place 3 cups cracker mixture on bottom of a buttered 13 x 9 inch baking dish. Top with half of drained oysters and half of cream mixture. Repeat with remaining cracker mixture, oysters, and cream mixture. 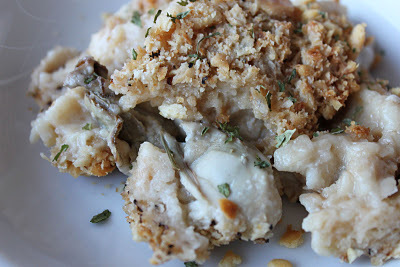 Sweet creamy Scalloped Oysters…how could I forget! If you love oysters, you will start making this recipe a regular…I promise!! !